In an unthinkable homicide case, a Florida teen and her younger sister have been charged in the shooting death of their older brother. "Anytime you come on scene with something this horrific, where you have juveniles or children involved, it's pretty unsettling, even to seasoned law enforcement and deputies," Columbia County Sheriff Mark Hunter said at a Tuesday press conference. The siblings, identified as Misty "Ariel" Renee Kornegay, 15, and Nicole Kornegay, 11, both face charges of premeditated murder. 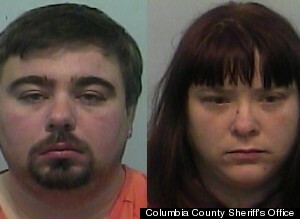 The girl's parents, Keith Kornegay, 37 and Misty Kornegay, 33, are facing charges of child neglect, police said. According to Columbia County Sheriff's spokesman Murray Smith, the investigation into the case began Monday night. Police in White Springs, a small town 70 miles northwest of Jacksonville, learned that the girls had run away from home and were spotted at a nearby Dollar General store. When approached by police, the sisters "informed [an officer] of a shooting at their residence," Smith said. Sheriff's office deputies were dispatched to the Kornegay's White Springs home, whereupon they found the body of the girl's 16-year-old brother, Damien Kornegay, sprawled out on the living room floor. He had been shot one time and was pronounced dead at the scene, police said. "Based on the preliminary investigation, it is believed that earlier in the evening the 15-year-old sister of the deceased retrieved a handgun from their parents' bedroom and used it to shoot her brother," said Smith. Nicole Kornegay's role in the shooting remains unclear. Smith would only say that she "assisted her 15-year-old sister" in the commission of the crime. The Huffington Post normally does not identify minors charged in connection with a crime, but both girls have been widely identified in news coverage, and their names have been released by the sheriff's office. Bayoubuzz.com reported Ariel Kornegay told police that her brother beat her up the day of the shooting. Authorities have yet to officially comment on a possible motive. According to News4jax.com, police had been called to the Kornegay residence in 2010, in regard to a report of "inappropriate behavior" that had allegedly involved Damien and Ariel Kornegay. Details of that alleged incident remain unclear and no charges were filed, the news station reported. Keith and Misty Kornegay's 3-year-old child, who was found alone in the home upon the discovery of Damien's body, has been placed in the custody of the Florida Department of Children and Families. The children's parents were reportedly out of town at the time of the shooting. The neglect charges were filed against them for "failing to properly supervise the children," Smith said. Ariel and Nicole Kornegay are being held without bond in the Columbia County Detention Facility. Both girls are expected to make their first court appearance sometime Wednesday. "This is a very unusual event for us here in the community -- very tragic," Sheriff Hunter said.